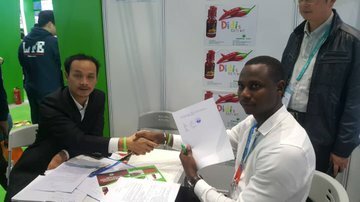 A Rwandan spices and chili producer and exporter, Diego Twahirwa, participating in the ongoing first China International Import Expo (CIIE2018) has secured a $2 million business deal to export his Didi’s Chili. The deal is immediate; from November 2018 to May 2019. The ongoing expo kicked off on Monday November 5, in Shanghai, opened by Chinese President Xi JinPing. It welcomed around 3,000 companies from 130 countries. Twahirwa is the only Rwandan who had the opportunity to attend. The expo offers linkage with potential buyers from the world’s second largest economy. Twahirwa said that as a matter of fact, Chinese are very willing and interested to buy African products and they don’t want to buy just a few of them; they want them in bulks. “What I noticed is that Chinese were very interested and willing to buy products made from Africa and they consider my product as innovation because they are not accustomed to chilly oil. Usually, they do not buy few things; they buy in big quantities,” he told Taarifa from China. According to how he saw the situation in the expo, Twahirwa realised that Chinese do not intend to buy chilly oil only but are also looking for dry African bird eye sauce, other chilis among many other African products. “I have noticed that all the people here would like to distribute our products, and they are willing to buy everything here. They have money, and trust African products,” he added. When opening the exhibition, Mr Xi said that “CIIE is a major initiative by China to proactively open up its market to the world,”. Here are some of the interesting items that are being featured at CIIE. Slovakian company AeroMobil’s first flying car, the 1.4-tonne electric-hybrid 4.0 STOL (Short Takeoff and Landing Aircraft), is making its Asia debut in Shanghai this week. The vehicle can travel both on land and in air, and can transform from car to flight mode in under three minutes. United States medical technology firm Medtronic is bringing what it claims to be the world’s smallest heart pacemaker to the CIIE. The wireless Micra Transcatheter Pacing System (TPS) is less than 10 per cent the size of traditional pacemakers. It is delivered through a catheter and implanted directly into the heart without the need for any surgery or chest incisions. The Micra TPS was approved by the United States Food and Drug Administration in 2016. Priced at 200 million yuan (S$39.9 million), Leonardo Helicopter’s AW189 is one of the most expensive exhibits at the CIIE. Italian firm Leonardo Helicopter has brought three of its helicopter models to Shanghai. The AW189, a high-performance, 8.6-tonne twin-engine helicopter, is one of the three helicopter models that the Italian firm hope will appeal to China’s jet-setting tycoons and businessmen. It can be used not just in commercial passenger transport, but also search and rescue missions and offshore oil-exploration operations. Leonardo also plans to establish a helicopter training centre and a final assembly workshop in China, reported Xinhua news agency. Logistics is one of China’s core industries, and American conglomerate Honeywell looks to leverage that growing demand in its second-biggest market, after the United States. Honeywell, which has about 13,000 employees in 30 cities in China, is set to debut its new connected supply chain solution Connected Freight at the CIIE. Connected Freight can provide real-time information about the location and condition of critical freight while in transit. Using this system, shippers and logistics companies will be able to monitor shipments of high-value and perishable goods, which could help prevent costly damage and loss, Honeywell Global High Growth Regions’ president Shane Tedjarati told Xinhua. China’s citizens are increasingly concerned about pollution in their cities, and electric cars are seen as a way to reduce emissions. China is the world leader in sales of new-energy vehicles, and the sale of these vehicles is projected to be on an upward trend. In line with the Chinese market’s interest in low-emission vehicles, Finnish multinational corporation UPM’s Biofore concept car will make its first appearance in China at the CIIE. Created with renewable and recyclable materials and innovations from the forest industry, the car weighs 1.1kg and costs around 30,000 euros (S$47,000). The Biofore concept car runs on renewable diesel, and emits 80 per cent less greenhouse gases than those that run on fossil fuel. Singaporean biotech firm Westcom Technology is introducing its bio-toilets that can turn waste into fertiliser in 24 hours. Each set of bio-toilet costs $2,000, and does not require water, electricity and complicated piping to operate. Luxury company Genavant, co-founded by renowned shoe designer Jimmy Choo and his godson Reggie Hung, is showcasing a pair of 30 million yuan (S$5.9 million) heels. Created by Choo and Hung, the shoes feature 400 to 500 pink and white diamonds graded by the Gemological Institute of America and will be displayed alongside other bejewelled shoes. Italian eyewear brand Nannini is bringing its revolutionary, ultra-thin glasses to the Chinese market. The reading glasses have rotatable nose bridges and can be folded and kept in a case 1.0mm thick, which means that they could be stashed in a jacket pocket easily. The glasses, which are made in Modena, Italy, were recently on display at the Museum of Modern Art in New York. The HUI Maori Collective, comprising of 11 companies, looks to bring Maori-produced food and beverage products to China. The range of products include fruit bars, wine and Manuka honey. New Zealand’s Minister for Maori development Nanaia Mahuta said that for the very first time, Maori exporters can enter into the modern world of e-commerce in ways that will derive benefits for New Zealand’s international status as a trading nation, CGTN reported. East African coffee chain Java House, which is based in Nairobi, Kenya, will be brewing its premium coffee at the CIIE. It is one of several African firms hoping to expand into the Chinese market, and has signed a distribution agreement with Shanghai-based logistics company Greechain International Ltd. The coffee market in China has flourished in recent years, with the total coffee consumption in China growing at an average annual rate of 16 per cent in the last decade, outpacing the world average of two per cent, according to figures from the International Coffee Organisation. The company has earmarked its Chinese foray to bolster its growth amidst the weakening competitiveness of the coffee industry in Africa, China Daily reported.